In their glittering, pointy-toed heels, six women shine their way onto the stage. Plum light bounces off the shoes, the silver buttons lining their pants, and their smiles. “We smile gracefully. Then we play. 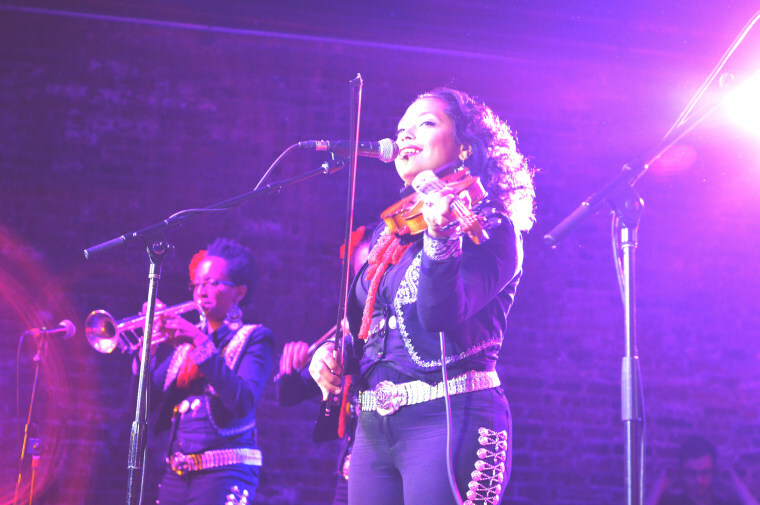 Then the jaw drops,” said Mireya Ramos, founder and vocalist of the band Mariachi Flor de Toloache, referring to the reaction they see among first-time listeners. For a mariachi group, a genre dominated by men since the early 19th century, Mariachi Flor de Toloache strays far from tradition. The members of this all-woman mariachi band are from Mexico, Colombia, the Dominican Republic, Cuba, Puerto Rico, Australia, Germany, and more. For many, Spanish was not their first language — so they sing in both languages, Spanish and English. When the mariachi fusion band first started playing, people whistled, whispered, and the bandmates say they had plenty of doubters. They occasionally still get this kind of response. Their solution? "Get up on stage, and own what you can do," said Lisa Maree Dowling, bassist. Last year, the band was nominated for a Latin Grammy for “Best Ranchera Album.” Now, Flor De Toloache will also make an appearance on Chicano Batman’s next album; they met through LA-based musicians and friends, Las Cafeteras. Efforts of their collaboration will appear in Chicano Batman’s forthcoming album. We sat down with the band to talk about how the group took off and how it’s fusing mariachi with other genres. How were you introduced to mariachi? Ramos: My father was a mariachi. I grew up listening to him sing. He would take me with him to all his gigs in Puerto Rico where he sang. He used to have a Mexican restaurant, he would sing from table to table. I grew up listening to him sing mariachi music. My mother is also a beautiful mariachi singer. She loves music from all over Latin America. I was brought up in a musical family. What were some of the initial reactions you got when your audience saw you were an all-woman mariachi band — a genre typically dominated by men? Fiol: Gosh, usually, my earliest memories were walking into a place and wanting to play mariachi. Maybe we were invited, maybe we invited ourselves, but we’d show up. Until the last few years, we’d get up on stage, even last year, and the first response is that people are whistling. It’s kind of like, “Oh, there’s some attractive women on stage.” But no, we are serious musicians, all of us do this for a living. Your members are very diverse. How did you find each other? Ramos: Through music. We all play all kinds of music in New York. We hustle. Either through a recommendation of somebody who is in the band already or some of the girls I met just playing in another band, “Oh do you want to join a mariachi?” If I see a girl and she’s a badass on her instrument, The first thing I want to do is recruit them for the mariachi. How would you describe the kind of music you play to someone who hasn’t heard it before? Ramos: That is usually a very hard thing to do because mariachi, when you say “mariachi,” people already have a certain stereotype, a certain sound in mind. I think this is a new approach for mariachi. So just think mariachi, urban, New York, experience, I guess. Passionate, feminine, but very powerful. What is a mariachi song that resonates with you? Ramos: There’s a lot. On our album, we have Penas de Amor, it’s a ranchera. I based it on “Me Equivoqué Contigo.” I think Ana Gabriel made it very popular. “Me Equivoqué Contigo” is a song about a girl or a guy saying “I made a mistake with you.” It’s telling the whole story about how they met and what a negative thing it was to meet this person, to have this person in your life and destroy your life. I wrote the song with the same kind of theme and similar melody as well, because it’s beautiful. Rancheras are very therapeutic when you sing them and you remember things that happen to you as a woman, they bring you back, they just feel great. You feel so powerful singing them. You sing in both English and Spanish. Why did you make that choice? Fiol: I’m not a native Spanish speaker. For me, it was convenient to sing in English because I already did and Mireya sings in English already. I think that it’s just like many things that evolve in our group, it’s very natural. Although I didn’t speak Spanish, I wanted to learn. Although English isn’t Mireya’s first language, she already knew she wanted to learn it. I don’t come from the [mariachi] tradition, it gave me a new perspective on it because I am from the outside. What does it mean to be able to sing in both languages? Luisa Bastidas (violinist): We were able to meet here through music, coming from different backgrounds that also represents us. Even the people in the band that don’t speak Spanish become more intimate with the language and are exposed to it. It’s a representation of us. Lyanne Alfaro is an Associate Producer of business news at CNBC.